Many automobiles will be on display at the LeConte Center, just off Parkway from the traditional meeting place of Traffic Light #6. There’s a door admission, but the streets are free and you won’t have to look to find the cars, they’ll find you. Parking may be a little tricky, and walking is the way to get around, mingling with a super-friendly crowd of enthusiasts and onlookers. There’s also a free shuttle to The Island nearby, with a whole world of entertainment and refreshment options. As always there are prizes and awards, with $8,000 in prize money for the best cars. People roll into town ahead of time and on different days during the event, and mostly disappear by Sunday, April 9. There’s a huge swap meet during the event with parts, accessories and memorabilia available from multiple vendors. 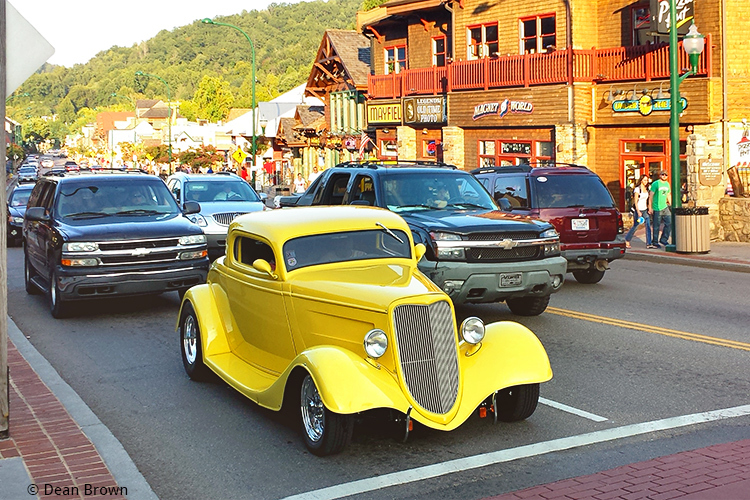 Check the 2017 Spring Rod Run website for more information about the event or call (865) 687-3976. And if you wonder where to stay during this event, check out our Pigeon Forge cabins, as well as our Gatlinburg cabin rentals and Wears Valley cabins.